P.-+. Albertsson and F. Tjerneld, Phase Diagrams. D.E. Brooks and R. Norris-Jones, Preparation and Analysis of Two-Phase Systems. G. Johansson, Partitioning Procedures and Techniques: Small Molecules and Macromolecules. H. Walter and C. Larsson, Partitioning Procedures and Techniques: Cells, Organelles, and Membranes. G. Johansson, Uses of Poly(ethylene Glycol) with Charged or Hydrophobic Groups. G. Johansson and M. Joelsson, Systems Containing Organic Solvents. H.E. Kerlund and P.-+. Albertsson, Thin-Layer Countercurrent Distribution and Centrifugal Countercurrent Distribution Apparatus. W. Maller, Columns Using Aqueous Two-Phase Systems. P.-O. Larsson, Magnetically Enhanced Phase Separation. G. Kopperschlager, Affinity Extraction with Dye Ligands. M. Joelsson and F. Tjerneld, Purification of Lactate Dehydrogenase from Pig Muscle by Affinity Partitioning. G. Kopperschlager, Phosphofructokinase from Baker's Yeast. G. Birkenmeier, Partitioning of Blood Proteins Using Immobilized Dyes. B.H. Chung, D. Bailey, and F.H. Arnold, Metal Affinity Partitioning. A. Blennow, Starch Synthase from Potato Tubers. J.S. Brusca and J.D. Radolf, Isolation of Integral Membrane Proteins by Phase Partitioning with Triton X-114. W. Maller, Separation of Proteins and Nucleic Acids. G.E. Francis and D. Fisher, Purification of Nucleic Acid-Protein Complexes. H. Walter and D. Forciniti, Cross-Partitioning: Determination of Isoelectric Point by Partitioning. G. Johansson, Charge Determination by Partitioning. S. Lundberg and L. Backman, Protein(Protein and Protein(Ligand Interactions. V.P. Shanbhag, Estimation of Surface Hydrophobicity of Proteins by Partitioning. G. Birkenmeier and G. Kopperschlager, Detection of Conformational Changes in Proteins by Probing with Poly(ethylene Glycol)-Bound Ligands. J.C. Hansen, Analysis of Protein Structural Changes in Steroid Receptors by Partitioning. P. Hubert, Use of Partitioning in Predicting Mild Hydrophobic Interaction Chromatography Behavior. H. Walter, Analytical Applications of Partitioning: Detection of Differences or Changes in Surface Properties of Mammalian Cell Populations. K.-E.I. Magnusson, Testing for Charge and Hydrophobicity Correlates in Cell-Cell Adhesion. P.T. Sharpe, Surface Changes during Growth and Development of Slime Molds. B. Martensson and S. Widell, Separation of Pollen from Nicotiana tabacum. G. Blomquist and G.B. Strim, Classification of Penicillium Fungi by Cross-Partition Analysis. J. Mendieta, Charge-Directed Affinity Partitioning of Cells. G. Birkenmeier, H. Walter, and K.E. Widen, Factors in the Affinity Extraction of Red Blood Cells Using Poly(ethylene Glycol)-Metal Chelate. L.J. Karr, D.L. Donnelly, A. Kozlowski, and J.M. Harris, Use of Poly(ethylene Glycol)-Modified Antibody in Cell Extraction. D.E. Brooksand S.J. Stocks, Use of Polyacrylamide-Derivatized Antibody in Dextran-Poly(ethylene Glycols) Systems. C. Delgado, G.E. Francis, and D. Fisher, Bioextraction of Low Abundance Cells by Affinity Partitioning. M.J.Lepez-Perez, Preparation of Synaptosomes and Mitochondria from Mammalian Brain. D.J. Morre and B. Andersson, Isolation of All Major Organelles and Membranous Cell Components from Single Homogenate of Green Leaves. C. Larsson, Isolation of Highly Purified Intact Chloroplasts and of Multiorganelle Complexes Containing Chloroplasts. P. Gardestrim, P.X. Petit, and I.M. Moller, Purification and Characterization of Plant Mitochondria and Submitochondrial Particles. M.E. Bradley, R.W. Lambert, and A.K. Mircheff, Isolation and Identification of Plasma Membrane Populations. D.J. Morre, T. Reust, and D.M. Morre, Plasma and Internal Membranes from Cultured MammalianCells. C. Larsson, M. Sommarin, and S.Widell, Isolation of Highly Purified Plant Plasma Membranes and Separation of Inside-Out and Right-Side-Out Vesicles. P.-+. Albertsson, E. Andreasson, H. Stefansson, and L. Wollenberger, Fractionation of Thylakoid Membrane. S. Yoshida, Isolation of Smooth Endoplasmic Reticulum and Tonoplast from Etiolated Mung Bean Hypocotyls. A. Persson and B. Jergil, Rat Liver Plasma Membranes. P.-+. Albertsson, Domain Structure of Biological Membranes Obtained by Fragmentation and Separation Analysis. J.P. Gierow, Relative Proximity of Domains in Plasma Membrane and Smooth Endoplasmic Reticulum from Rat Liver. J.I. Clark, Lens Cytoplasmic Protein Solutions: Analysis of a Biologically Occurring Aqueous Phase Separation. F. Tjerneld and I. Persson, Cultivation of Trichoderma reesei and Production of Cellulolytic Enzymes. F. Tjerneld, Enzyme-Catalyzed Hydrolysis and Recycling in Cellulose Bioconversion. R. Kaul and B. Mattiasson, Biotransformation of Hydrocortisone into Prednisolone. G. Johansson, Recovery of Proteins and Phase-Forming Chemicals. N. Papamichael and H. Hustedt, Enzyme Recovery by Continuous Crosscurrent Extraction. R. Woker, J. Vernau, and M.-R. Kula, Purification of Oxynitrilases from Plants. J. Paulsen and H. Hustedt, Extractive Purification of Aspartase from Escherichia coli K12. A. Cordes and M.-R. Kula, Large-Scale Purification of Formate Dehydrogenase. H. Schatte, D. Schustolla and H. Hustedt, Extraction and Purification of Leucine Dehydrogenase from Bacillus cereus. U. Menge, Purification of Proteins from Cell Culture Supernatant Solutions. K. Kihler and A.Veide, Uses of Fusions of Ga lactosidase and Peptides to Proteins. L. Hammar, Concentration of Biomaterials: Virus Concentration and Viral Protein Isolation. A.-L. Smeds and S.-O. Enfors, Extraction of Chromatophores. H. Vilter, Extraction of Proteins from Sources Containing Tannins and Anionic Mucilages. G.B. Strim, B. Malarstig, and G. Blomquist, Purification of Water-Based Cutting Fluids. Author Index. Subject Index. 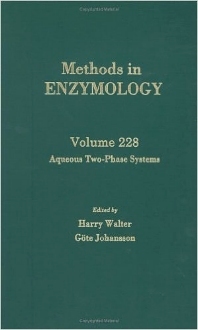 This volume of Methods in Enzymology represents the sole collection of separation methods based on aqueous two-phase systems. It includes procedures for the isolation of proteins, especially enzymes, nucleic acids, cell membranes, and organelles, as well as for the separation and study of cells. Biochemists, biophysicists, molecular biologists, cell biologists, physical chemists, microbiologists, biotechnologists, plant scientists. Aqueous Phase Systems, Washington, D.C., U.S.A.